Giant logs are easiest to cut up on the spot where they were felled. 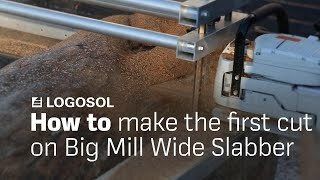 The Logosol Big Mill is a complete equipment package that gives you unique opportunities to make use of valuable giant logs. Cut wide, rough-edged boards from different sorts of fine wood. The system with two guide rails gives stability and highest precision. You work quickly and safely in a comfortable working position. 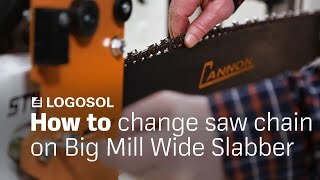 After some practice, you will only need a couple of minutes to set the equipment for the next cut. This sawmill can handle log lengths up to 2.7 metres and diameters up to 110 cm. You can extend the equipment for longer logs. Chainsaw and cutting equipment are sold separately. Length: 2x3 metres as standard. Easy to extend. Recommended motor power: Min. 9 hp. We recommend the Stihl MS880.